Russia has deployed 215 more nuclear warheads than allowed by the New START treaty, setting itself up to violate a provision that goes into effect next year. Surely this will end well. New START allows 1,500 deployed warheads, with that goal supposed to be reached in February 2018, and it’s designed to help both the U.S. and Russia know what each country has as far as its stockpiles. It also allows verification to ensure both nations are honoring their obligations, with on-site inspections and data exchanges are required. The regime is extremely intrusive and, arguably, has helped avoid another Cold War, if you consider how unstable relations would be if neither Washington nor Moscow knew what the other country had. And right now, the two parties are supposed to be working to reduce their number of deployed warheads, not actively increasing them. But it looks like Russia is doing the latter. New satellite images reveal extensive construction of two Northern Fleet facilities for warheads and ballistic missiles on the Kola Peninsula in far northwest Russia, according to The Barents Observer, which analyzed satellite images via Google Earth along with open-source data on Russia’s nuclear weapons stockpiles. There are four storage areas for nuclear weapons on the peninsula, all of which are in close proximity to Norway. The nearest weapons storage area is Zaozersk, which is around 40 miles from the Norwegian town of Grense Jakobselv. All four are within an 118-mile radius away from Norway, a NATO member state. To put this context for folks stateside, Norway is roughly 4,463 miles away from the United States. One of the satellite images (below) shows Yegelnaya Bay, where the Gadzhiyevo naval base is located. Based there are six Delta IV-class ballistic missile submarines and the Yury Dolgoruky of the Borei-class. Three more Borei-class submarines, the most advanced in the Russian ballistic missile submarine fleet, are expected to arrive there soon. It is possible to date the image to late summer 2016 by counting the 81 reactor compartments stored in the nearby Saida Bay where also the “Itarus” transport barge can been seen. This barge was tranferred from Italy to the Kola Peninsula last spring. At the jetty in the bay, a Delta-IV class submarine is visible dockside the crane for loading and unloading ballistic missiles. The missiles are driven to the jetty from the storage in the valley behind where both the original storage and the new under construction are visible. The nuclear warheads are, for the most, stored inside the mountain to the left. Three new reinforced bunkers and five similar bunkers under construction are visible. In the end of the valley, the entrance to an underground storage can be seen. The entrance to another underground storage is visible also at the first nuclear weapon storage facility. A nuclear missile transit hangar is located on the road towards the loading jetty. The Barents Observer analyzed other sites on the Kola Peninsula, but the developments mean one thing for U.S. national security: the Russians are well ahead of the U.S. in their Arctic strategy and are solidifying their supremacy with nuclear weapons. As we’ve noted before, Washington has long been asleep at the wheel when it comes to prioritizing the Arctic Circle from a geopolitical standpoint. The United States Coast Guard, for example, is the primary service that oversees all issues Arctic. Yet, President Donald Trump’s current budget proposal calls for a 14 percent cut to the Coast Guard. At the most basic level, Congress seems unwilling to invest in heavy icebreakers that provide critical access to the Arctic Circle. During a recent trip to Seattle, I had an opportunity to tour America’s only heavy icebreaker, the USCGC Polar Star (WAGB-10); the engineers have done a great job maintaining it, but it should have been retired more than ten years ago. The Coast Guard has to use it due to lack of funding over the years to build new ones. Russia, on the other hand, has 40 icebreakers. Indeed, Russia’s northern border lines the Arctic area, so it makes sense for it to command the region. But, it appears that the United States isn’t even trying to counter the Kremlin for some significant presence. The increase of nuclear weapons facilities in the Arctic region is just another major geopolitical step in Moscow securing the area as its own. 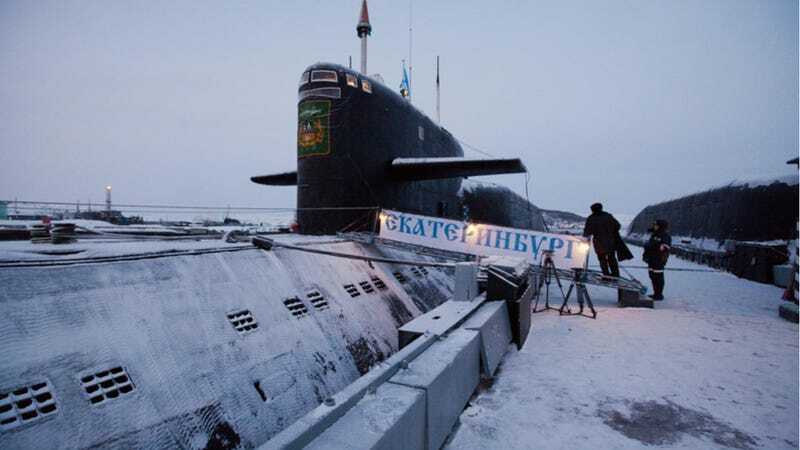 Right now, some 60 percent of Russia’s 700 sea-based strategic nuclear warheads are on the Kola Peninsula, according to The Barents Observer; the remaining 40 percent are with the Pacific Fleet at Kamchatka. Russia isn’t technically violating the New START treaty, however: as long as it reduces the number of deployed warheads to the agreed-upon limit before February 2018, it should be fine, Kristian Åtland, a senior researcher with the Norwegian Defence Research Establishment, told the publication. The main issue is whether or not New START is a major policy item for President Trump. It doesn’t appear to be. During his first official phone call with Russian President Vladimir Putin, Trump didn’t even know what the treaty was. He has also blasted the treaty as a one-sided deal, which is simply not true, as not only does it limit warhead deployment and increase transparency for the Russians, but it does exactly the same for the Americans. So far, the current administration has not signaled that it is ready to make a move on New START or the Arctic Circle. Russia, on the other hand, has certainly made theirs. Several of them, in fact.